Camcorder Info has reviewed the flash-based camcorder Panasonic HDC-TM300. This camcorder features full HD recording and 32GB built-in memory. It will be interesting to see what the reviewer thinks about the video quality. Camcorder Info ends up giving the Panasonic HDC-TM300 a very good review as the camcorder is able to record video of high quality with little noise and strong colors. It also takes good still photos, and has nice features and design. 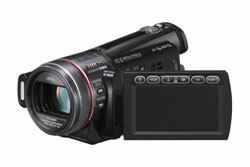 The reviewer thinks the Panasonic HDC-TM300 is one of the best camcorders in 2009. Read the full review of the Panasonic HDC-TM300 camcorder here.